As I mentioned on Tuesday, I spent three hours with a professional organizer in an attempt to clean up some of the clutter in my life. I also referenced a quote linking physical clutter to emotional clutter; a concept I've been thinking about all week. I'm not sure what else to say except that I feel like I'm on to something here-- something that is going to change the way I live significantly. I already feel like my life is starting to head in a direction that makes a little more sense...unfortunately, sometimes things need to get messier before they get cleaner, straighter, and more organized. That's where we are right now...in the mess...but I'm hopeful and optimistic about the outcome. So let me tell you a little bit about what we did so that if this is something you have been thinking about in your life as well you can perhaps glean some ideas from my experience thus far and as I move forward. This all started because back in November I got an email for a Groupon offer (my husband rolls his eyes at my Groupon buying but I've gotten some good deals!). The deal was for 1/2 off professional organizing services. I was skeptical about spending the $60 at first, but then I thought, "well, I used to spend $20 an hour on therapy...this is kind of like therapy for a different component of my life...a component of my life making me so crazy that it is going to put me right back into therapy if I don't do something about it!" So, I justified it, sheepishly told Scott, and buried the Groupon in one of my many "to-do" piles. I initially thought I would have her come help me organize my basement (a nightmarish site for someone in her line of work, I'm sure! ), or maybe the kitchen, or my closets...I felt kind of ambiguous about where I needed the most help. When we finally chatted a couple of weeks ago Jennifer asked me where I'd like to focus our time. I think I laughed aloud, giggled, then laughed some more. She assured me that this was a pretty typical response. After a little hemming and hawing it dawned on me that the area of my life that causes me the most grief is my paperwork. Paperwork for me includes a lot of material used for my writing; old magazines, research, notes, notebooks, story ideas, published stories, etc. It also includes journals, bible study materials I've enjoyed and maybe some church notes. 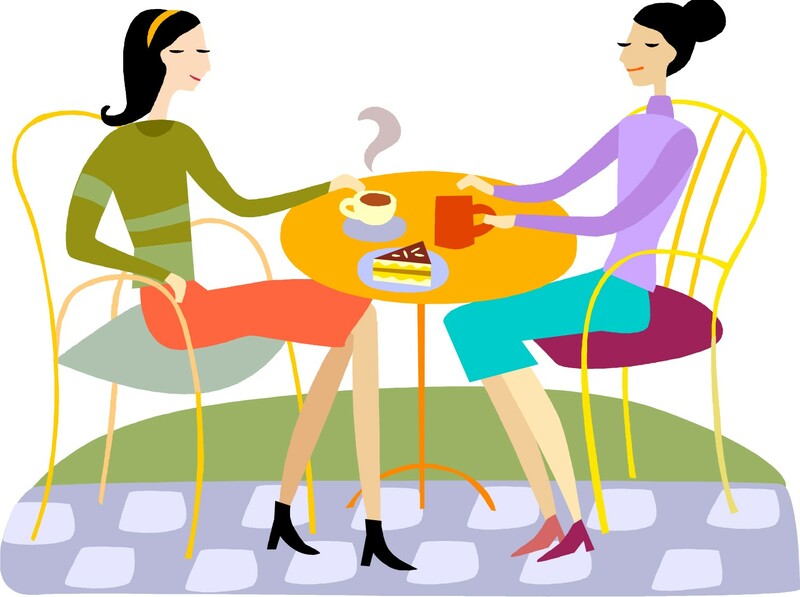 It also includes credit card information, medical information, the girls artwork, the girls medical information, craft ideas pulled out of magazines, recipes pulled out of magazines, incoming mail, outgoing mail, etc. etc. etc. etc. I'm sure you've got similar lists. So, not only was "it" all over my house, but "it" was in so many locations in my house that I had no idea where "it" was when I needed "it"...if you catch my drift.... I had file folders upstairs in the bedroom and notebooks downstairs by the t.v. I had recipe folders and binders in the kitchen, my office (upstairs) and a file bin in our former dining room. I had stacks of papers I needed to sort. Unread magazines ALL over the place and multiple "to do", "home improvement" and "craft" folders in varying locations. Can any of you relate to this? One of the biggest problem's for me is that I was procrastinating doing things I needed to do because a) I couldn't find the corresponding paper's for the job (notes, phone numbers, appointments, recipes, etc.) AND I was also not putting things in proper places because I was a bit confused about what the proper places were...so I would get overwhelmed at the thought of a task because the time it was going to take for me to find what I needed for the task. You can see why I needed help, right?! 1. The space I was using for my office was too small (currently in a corner in our spare bedroom). plus...I threw all of our clean laundry on the bed in there, which wasn't exactly impacting my writerly inspiration in a positive way. plus...every time w had guests (which is frequent enough with quite a few out of town family and friends) I would "clean" the room by shoving everything I had been working on into big piles and either jamming it in the closet or under the bed...then it would take me an hour to just sort through things once I finally got to them again. 3. Jennifer kindly pointed out that three rooms in our downstairs were being devoted to kids stuff (a corner of the living room, the entire spare room/sitting room to the right when you walk in the house, and part of our "dining" room, while I was jammed into the spare bedroom. The solution: make one of the downstairs rooms into an office. Which is where we are today. My dad, the master of all carpentry things, is coming over shortly to give my hubby some much needed direction. So...as I said, things are messy, but it's messy with a purpose now. this is the former "play" room. It's directly to the right when you walk in our front door...we've moved my desk downstairs and as you can see I have some very sophisticated office furniture at this point...(aka an ironing board and an old bookshelf from the playroom!) We're planning to put up walls and french doors so I can lock myself in! you see all of those random baskets? this is the beginning of my sorting with Jennifer. She says that most people have 80% of what they need to get organized. Her point was, start by using what you have...buy fancier baskets later if you'd like, but let's get the system down first. One now holds "contacts" I need to file, one holds receipts and one holds the random photos that were laying around the house. The key is that EVERYTHING needs a home. Which is why she and I spent a couple of hours sorting all of my papers and giving them "categories". this is our "dining"room, which was basically a spill over from the playroom. Now it IS the playroom. We weren't planning on buying dining room furniture anytime soon anyway, and it is right next to the kitchen which is great for me and the girls when I'm working on meals and they can be playing right next to me. I owned 2 of these cubes from target and bough 4 more yesterday...the whole system is interlocking and has all sorts of pieces and accessories so that you can organize to your liking. It's a little messy at the moment, but it's going to be GREAT for the girls stuff. As pieces go on sale at Target I will buy a few more to add on. 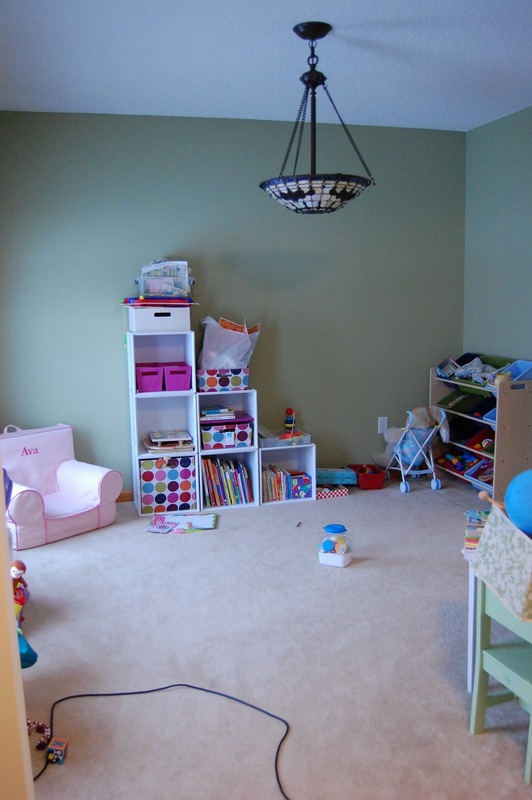 This is the other corner of the playroom. I now have their little table (where they like to color) situated next to the craft supplies (in that tall white thing (two rubbermaid 3-drawer organizers stacked on top of one another). I pulled the rubbermaid things out of our mudroom making more room in the mudroom for shoes and now the craft supplies are right where I need them! the clean laundry that usually adorns the bed in the spare room and all of the stuff that was piled on my desk that needs to make it's way downstairs. the leftovers that Jennifer and I did not get to last week. Organizing (also spelled organising) is the act of rearranging elements following one or more rules. Anything is commonly considered organized when it looks like everything has a correct order or placement. But it's only ultimately organized if any element has no difference on time taken to find it. In that sense, organizing can also be defined as to place different objects in logical arrangement for better searching. "Clutter is anything that complicates your life and prevents you from living in peace as you live out your life purpose...Think of it as any possession, habit, thought pattern, attitude, or activity that (1) you don't need or use anymore (2) doesn't fit or work for you like it used to, or (3) doesn't add value and meaning to your life as it once did." 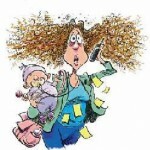 I have a confession...well, yes, I am disorganized...but you already knew that about me. My actual confession is that I had fully intended to write a post about my New Years resolutions and never did, in part, because I knew that once I had put them in writing, they would seem more real. If you don't fully create them you can't be as disappointed in yourself if you don't keep them, right? There is only one really. It is leftover from last year. It is on the "not accomplished in 2010 list". The resolution is to become more organized. Did you read the quote above? Well, that's me. Not living in peace because I have too many possession's, habits, thought patterns and activities in place that are not adding value to my life or helping me to reach other goals. My mom bought me this book a couple of year's ago (the one referenced above). It's been sitting in my "to read" pile, and while I had evidently started it (obvious by the many lines I had already starred and underlined in the first couple of chapters) I never finished it and certainly have not implemented the habits into my life. What I like about it though is that it is one thing to buy a book about organizing the "stuff" in your life, but there are real hard changes that have to take place in one's habits before you can ever dream about living a more organized life long term. This book talks about how it is more a heart issue than simply a stuff issue. Well, here is the deal...I'm committed to tackling this area of my life this year and I'm writing about it because it offers me some accountability. Kind of like when I committed to running a 1/2 marathon last year, and losing that last 15 lbs. of baby weight...writing about it helped me to DO something about it! So my first step to doing something actually happened yesterday. I had a professional organizer come over to my house! "Huh?... (long pause) What does that mean?" I know. It seems a little ambiguous and perhaps unnecessary at some level, right? Like, "Com'n lady, get your act together and just clean up your sh*!...do you really need to pay someone to do that for you?" ...and then he probably rolled his eyes. All that said, this woman's name is Jennifer Ford Berry. She has a website that you can check out here ( Organize This Life! ) and she has changed my life already! Truly. She lives outside of Buffalo and she has been a Godsend. I say that in the truest sense. I think God put her in my life to help my live the life I've always wanted to live. 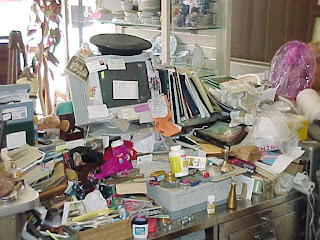 I know I sound a little like one of those crazy hoarders after Peter Walsh cleans out their houses...but, while my clutter may not have been nearly that bad, the emotional space it was taking in my brain was causing enough strife in my life. Alright, I'm going to stop there for today...I know you are sitting on the edge of your seat waiting to hear more about Jennifer...(who by the way, I gave the link of my blog too, so Jennifer, if you are reading this, "Thank You" and I'll see you next week!) but my children need to get up from their naps and most of you are also mommas with short attention spans (that out of necessity need to match that of your children), so I don't want to go on and on in one long post that you won't read the end of. That said, check out Jennifer's website for now and leave a comment if this is a crazy area in your life as well. Maybe tell us how you've tackled this part of your life. I always love to hear that I am not alone in my struggles! I know that sounds a little sadistic, but really, I mean it in the nicest way! I promise to write more this week about my eye-opening three hour session with Jennifer and what I plan to do about it all. P.S. Just for the record, the above picture is not of my house. I swear! But doesn't it just make your skin crawl?! It seems to me that some much needed encouragement came in the way of my daughters watching Little Bear this afternoon. Right at the most poignant time too. This is how the conversation was going with my sister right before the much needed Little Bear episode. Her: Lisa, you need to be content. You need to find joy in the little things and focus on what is most important. Her: Have you prayed about how to handle the girls? Have you prayed for wisdom to focus on what is important? You can see who the mature one is here (despite the fact that I am actually the older sister!). The truth is the weather IS wearing on me. I don't recall a grayer, snowier winter...or perhaps I just don't recall the winter ever affecting me this much. I'm tired, tired, tired. Seriously, by 6:30 I want to go to bed. I don't have the motivation to do the things I normally do. I'm crabby. I know, I know...I'm trying to be peaceful and joyful, but it FEELS hard right now...In the past I thought the "winter blues" or SAD (seasonal affective disorder) were just nice little terms for some mild winter blahs, but this year I get it...I FEEL it physically and emotionally. So anyway, I don't want to be a total downer here...just being transparent, as usual! I finally put the t.v. on for the girls because I was cleaning up the kitchen for the 72nd time today and imagine my surprise when it was the Little Bear episode that gave me a little pick me up (not the cookies we had made, or the extra coffee I drank, or the chocolate and noodles I had already eaten!). They started chanting the above rhyme and my ears perked right up. I've actually printed it out and put it smack dab in the center of my fridge! I like their little poem. It's about getting through things as a family. It's about life not always being exactly as we'd like, but getting through it together. It's why God blessed us with spouses and children! AND, to add more fun to the day, at the end of the show Little Bear's friend Emily's grandmother scooped up some snow from outside their window, added some cream and honey in a bowl and made snow cream! I thought "I've got to look this one up online!" The girls and I are going to make some of this after their naps later. Ava loved the idea! "Whatever the weather we'll weather together, whether we like it or not!" Anybody else out there have a list of things that they aspired to accomplish during the month of December, but somehow just didn't seem to get to? We put so much pressure on ourselves, don't we? Every year I promise myself it's not going to happen, and every year it does...I get frazzled and tired and end up with 3 colds and feel crazed! and, in the end, I am disappointed at some of the things I didn't end up doing instead of relishing in all that I DID. I'm not implying that I didn't enjoy Christmas, because, if you read my last post, truly I did. I just wish it hadn't come with so much emotional turmoil (in the weeks before) on my behalf. All that said, I have a few positive thoughts to offer to anyone else who found themselves in the same boat...a few 'don't be so hard on yourself' thoughts. Christmas is an INCREDIBLY joyful and exciting time, especially if you have children. HOWEVER, it is only one day out of the year, it has become incredibly commercialized and it isn't even Jesus' REAL birthday! Alright, now you're probably thinking "Geez Lisa, thanks for the positive, uplifting words...next blog please!" My point is this...I think the Christmas season is a WONDERFUL time to be filled with inspiration to feed the poor, give gifts to less fortunate children, bake cookies for and connect with your neighbors, reach out to family members you haven't seen or connected with in a long time, spend extra time with those you love and so on. But, it does not need to be the only time we do these things. For example, Scott and I made a list of things we wanted to accomplish during the Christmas season. Our list included finding and helping a less fortunate family (with food or donations or something tangible), having a get-together with some of our neighbors so that we could develop better relationships with them and I personally wanted to reach out to a family member I haven't been very close with ( a cousin) and to just have coffee and check in with them (they have had a difficult go of things in life). When I was reflecting on all of this several days after Christmas and feeling a little disappointed I had the most wonderful God-inspired thought: Lisa, just because Christmas is over doesn't mean you can't still do those things. The poor are still there. Your neighbors still need to be loved. Your cousin's life didn't miraculously become easier in December. This wonderful peace came over me and almost brought me to tears. Thank you God! And THAT is what Christmas is all about. It's about Christ coming into the world to be human. To serve humans. To love humans in a tangible way. Not just on his birthday, which would be silly, but ALWAYS. All the time. All YEAR round. So...if you were inspired to do good things this Christmas, but didn't get to some of them because life got really busy, cut yourself some slack. Most of us are parents of young children, and about all we can handle right now during a month as busy as December is often just loving on our own children and reaching out in small ways...making a few cookies, talking to a couple of neighbors, and at least writing down your good thoughts about helping others. BUT, here is our challenge. Find a way to take those very thoughts and turn them into ACTIONS this year. I am resolving to still have a get-together this month or next with my neighbors, to still seek out a family in need and to get in touch with that family member, but I'm giving myself the WHOLE year to do it...not just a couple of weeks. What kind of blogger would I be if I left you hanging ALL through Christmas and then neglected to send you Happy New Years wishes as well?! We've had a wonderful couple of weeks. Stressful at times, yes. Chaotic, check that box too. But, wonderful nonetheless. Scott and I actually both agreed that it was one of our favorite Christmases in a long time. I'm not sure that we could pinpoint exactly why, except to say that our girls are at a really FUN age for celebrating Christmas (i.e. they get excited about the load of $5, $10 or $15 presents we gave them, and are not asking for Uggs, or i-pods, or $80 jeans, or other sorts of ridiculousness that I've heard about from mom's of older children...my girls are NEVER going to be that way, or request those sorts of things...I'm sure of it!). Besides our girls being at an incredibly fun age for things like holidays and birthdays and the many other annual celebrations, we were surrounded by a LOT of family and it was wonderful. This is our second Christmas back in Buffalo and I have to tell you that Christmas alone was worth the move back. It was always one of the holidays that, while we were in MA and traveling back here for Christmas, made us think 'maybe, just maybe, someday, we will move back. Not because we like Buffalo all that much, but because we miss the closeness of family. 'This was a year that made it all worthwhile. Without getting into all of the long details (that would certainly only be interesting to me! Like making people watch your old home videos!) Scott's mom came in on the Thursday before Christmas and was able to help me with the girls while Scott played guitar at 4 (yes, I said FOUR!!!) Christmas Eve services-- a HUGE blessing. Christmas morning through the eyes of two toddler's is exciting; smiles and shrieks and a flurry of wrapping paper. My parent's came over for lunch, we all took naps in the afternoon, we went to my mom's for dinner and then to Scott's dad's to hang out for the rest of the evening. It was just very, very nice to have been able to see everyone while still being able to wake up, nap and return to the comfort of our own home throughout and at the end of the day. I wouldn't have changed a thing. So what else is going on in my life? Well, my doctor says I have irritable bowel syndrome so I've been eating yogurt like a mad woman. I'm sure you really, really, wanted to know that. (Believe me, I've spared you some of the nittier, grittier details of my intestinal habits since last week!). She says I ate way too much junk, and got too stressed and this is my payback....Great. 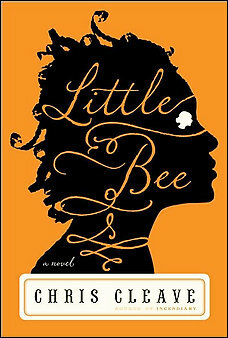 Reading Little Bee for book club. I have to say this is one of the DARKEST books I've ever read. Honestly, if it wasn't for book club, I would have taken it back to the library already. It is very well written...but seriously, when I read, I'm usually looking for an upper, not a downer. Not so much with this one so far. Hoping it is redemptive in the end! Just read Naptime is the New Happy Hour. If you have toddlers and are looking for a quick and VERY funny read, this book will have you laughing aloud! Slight warning, if you are a bit conservative in your lifestyle and beliefs, like yours truly, the author's honesty and candidness in some parts of the book are slightly off-putting and you may find yourself briefly offended, but the humor makes it worthwhile in the end! Started The Prodigal God: Recovering the Heart of the Christian Faith by Dr. Tim Keller before Christmas. A very good book. A short book (I should have finished it by now!). A spin on the prodigal son story that really allows you to see God in a bigger, broader and more profound way. I would highly recommend it if you're looking for a short, but well-written book on the Christian faith. Finishing Without A Word. 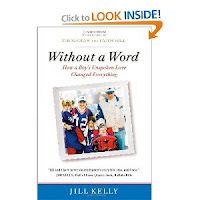 This is the Jim and Jill Kelly story. For those of you who don't live in Buffalo, Jim Kelly was a well known quarterback for the Buffalo Bills for a number of years. Not surprisingly, all of his fame could not buy the family happiness...it was through having a son, born with a life-threatening and eventually fatal disease, and losing that wonderful little boy, that brought that family to their knees and changed everything for them. Jim and Jill are now speaking at churches and spreading the word about their faith journey. I'm currently reading (and by far my favorite book at the moment!) 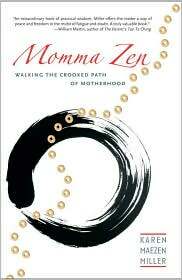 Momma Zen: Walking the Crooked Path of Motherhood. While Miller and I may not agree when it comes to our theology (she is a Buddhist priest), this book is a reminder that motherhood is such a universal experience that you can have absolutely NOTHING else in common with someone and still feel that you connect with them on some level if you are both mothers. Miller does not push any sort of theology on her reader, she simply offers poignantly written experiences about bearing children and being a mother. It is VERY well-written and one of the best books I've read on motherhood to date. If you've ever struggled with the challenges of motherhood, the tireless hours, the tedious tasks or the loss of self, you will find this book incredibly refreshing. Miller is able to confess her own similar feelings, but in the end encourages the reader that it is all ok-- that you're going to make it. Every time I finish a chapter I feel SO much better about myself as a mother and about my parenting! 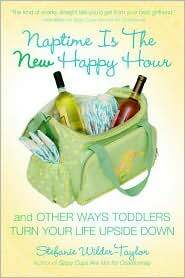 The chapters are also relatively short, which is an added bonus when you're a mom! alright...enough book stuff for today...I have a major stack of 'want to reads' as well...and also have some thoughts about New Years Resolutions for the year, which I'll save for another post in the next day or two. Hope you are all well. Happy New Year!! If you are reading and have good book you are currently reading, particularly on Christianity or Motherhood, leave a comment with the title! I love new book suggestions as do your fellow bloggie readers!